Today we manufacture in purpose built factories in Hoddesdon, England and our 800 products are distributed to over 100 countries globally. Our highly skilled team has a lifetime's experience in producing high technology darts products, designed to satisfy the needs of players the world over, from the beginner to the professional. 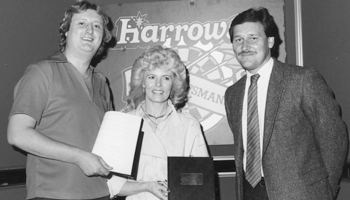 In 1985 we teamed up with Eric Bristow, the 5 times World Champion, 5 times World Master and without question the "name and face of darts". This was the biggest darts player endorsement deal of all time and it was signed live on national terrestrial T.V. Also included in this high profile signing was the Ladies Number 1 player of the era and "First Lady of Darts", Maureen Flowers. This deal netted the man they call "The Crafty Cockney" a cool £250,000. This proved to be a pivotal moment for us, dramatically increasing our profile overnight. Concurrently with our support of darts at grass roots levels, the eighties saw us exhibiting at sports trade shows globally. Gradually we started to develop a network of wholesale distributors worldwide. These companies act as suppliers of our products to retailers in their designated territories. We recently celebrated 30 consecutive years at the largest sports trade show in the world, ISPO, in Munich, Germany. From our inception until the mid 1980’s our activities revolved around traditional darts, in which players throw steel tipped darts at a compressed sisal dartboard. 1987 saw us enter what was an emerging new phenomenon in the sport, namely softip darts. In this version of the game the players throw plastic tipped darts at an injection moulded plastic dart board, which automatically calculates the score for the player. Softip darts has gained such popularity around the world that in many countries it has virtually eliminated the traditional version. 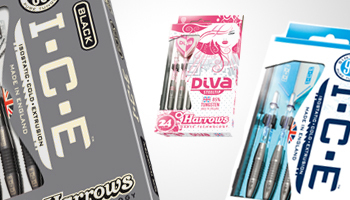 As a company we recognise and encourage both types of darts, as at the end of the day darts is the winner! 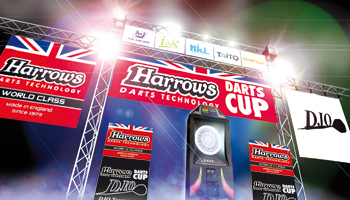 Our support of softip darts has recently seen us team up with promoters in Japan who organised a series of 20 tournaments across that vast country, under the title Harrows Darts Cup. The innovative sport promotion concept of taking the tournaments to the players saw 50,000 people participating, from Sapporo in the north to Osaka in the west, culminating in the Grand Final at the Big Site exhibition centre in Tokyo. By the early 1990’s darts was suffering from a lack of T.V. coverage and interest in the game was on the decline. We were founder members of the World Darts Council (W.D.C. ), which was an organisation created to increase the profile of darts and encourage sponsors and T.V. back to the game. Following a protracted legal battle with the British Darts Organisation, which culminated in a high profile court case, the W.D.C. agreed to drop the “W" and re-brand itself the Professional Darts Corporation (P.D.C.). The P.D.C. has gone from strength to strength, and today its roster of tournaments enjoys massive TV exposure worldwide. Over the years we have evolved into a great British success story. 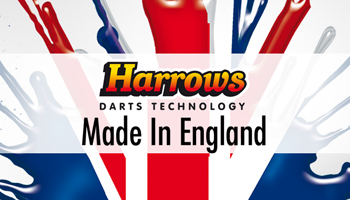 We enjoy a unique position in the world darts trade, being the only brand maintaining production in England. In 2007 our achievements were recognised by the UK Superbrands organisation, which selected us as a Sports Brand Leader. In the awards citation the Chairman of the Sports Brand Leaders Council, Stephen Cheliotis, stated: "Harrows has been selected as one of the UK's strongest sports brands. This is a supreme endorsement of your brand’s exceptional status". We have helped to transform the sport of darts by driving its appeal beyond the UK. We have distribution covering North America, every country in Continental Europe, Australasia and the Far East. Indeed, China now represents a major market for us too, where English made products, and darts in particular, are highly regarded. We have gone to unprecedented lengths to spread the darts gospel, supporting players as far afield as the Solomon Islands, where we sponsor the official darts leagues. 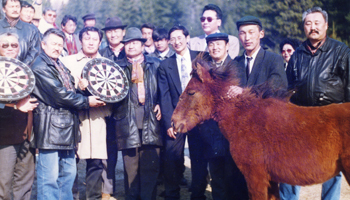 In 1993 another of our more extreme adventures saw us sponsoring the Harrows Mongolian Open in Ulan Bator. This tournament was quite extraordinary as, instead of the usual trophy, the winner walked away with an unusual prize . . . a donkey, this being deemed more useful! In addition to Bristow’s continued endorsement of our products he is supported in the Harrows stable of players by PDC superstar Wayne "Hawaii 501" Mardle and Shingo Enomata from Japan. As an investment in the future of the game we also sponsor up and coming players both at home and overseas. The original company logo incorporated the sub heading "Pure Dartsmanship". In 1985 this was changed to "Darts Technology" – a line that we felt more clearly reflected our investment in state of the art research and development programmes, designed to create products with a true technical bias, which improve player performance. To support these technically innovative products we have developed an excellent modular retail merchandising system. Prior to our entry into the darts market the product category had no true retail "home". Retailers tended to mix their darts stock in with other non-related sports articles. By installing dedicated darts merchandisers we were able to create a clearly defined darts retail presence. Our merchandisers, which number 5 in total, are sized according to the level of interest in the sport in their particular area or country. Over the years our marketing has included a fair degree of humour. Darts is a fun, sociable sport, so what better way to reflect this than some creative and amusing promotional ideas. There is no better way to get to the darts match than on a Dart-o-Bike. 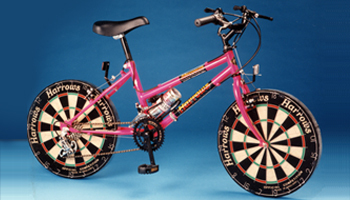 This unique vehicle comes complete with removeable dartboard wheels for instant matchplay action – and also features that all important onboard beer dispenser! As we look to the future we will continue to push out the boundaries of innovation. Using our UK production, we will power ahead in the world market that we already dominate!